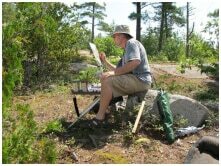 Although Rick’s preoccupation is painting, he is also an active cartoonist and illustrator. His autobiographical cartoon strip, The Blackboard Jumblehas appeared for many years in a variety of publications. He illustrated the critically acclaimed comic book series Wordsmith and in the early nineties he drew Sandman Mystery Theater for D.C. Comics. A lifelong learner, Rick has attended art classes at Humber College, Sheridan College, O.C.A.D., York University, The University of Guelph, and Springbank Visual Arts Centre. Artist, Rick Taylor, was born in Fergus, Ontario.